Puja Shroff Thoria is a Licensed Professional Counselor (LPC) licensed in the state of Michigan. She is also a National Certified Counselor (NCC) certified by the NBCC (“National Board of Certified Counselors”). 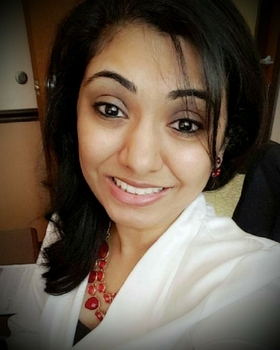 Puja has been practicing in the field since 2011, shortly after acquiring her MS in Counseling and Clinical Health Psychology from Philadelphia College of Osteopathic Medicine. While completing her graduate degree, she interned at a non-profit community mental health facility in Philadelphia. She has earned her BA in Psychology from Case Western Reserve University, Cleveland, OH. Puja has experience conducting individual and group therapy in an outpatient setting with diverse populations: ranging in various mental health disorders (i.e., depression, anxiety, PTSD, life transitions, & other mood disorders), age groups (i.e., late adolescence, adulthood, geriatric), and ethnicity. She is of Indian descent with particular sensitivity to other’s cultural, ethnic, and religious beliefs, values, and viewpoints in conjunction with treatment. Puja is a certified Cognitive Behavioral Therapist who also implements principles of Positive Psychology, Mindfulness, Spiritual Psychology, Grief Counseling, and Solution-Focused approaches in treatment.